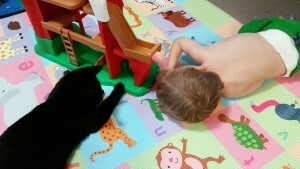 I thought I had a good grasp on parenting before we adopted our cat, Tardis. and Tardis loves the boys in return. Which turned out to be a bit of a problem because Tardis always wanted to be around the boys and play with them and would keep returning to them even after they hurt him. At the same time, the boys didn’t understand why you could hug and kiss people, but not Tardis. They thought it was funny that Tardis would scratch and hiss at certain actions. I’m sure it didn’t help that Tardis bites and claws as a form of play too. It was sometimes hard for them to tell when Tardis went from playing to upset. We did gentle modeling and tried to show what to do rather than what not to do, but it wasn’t working fast enough and we weren’t willing to get rid of or isolate Tardis. At the same time, we didn’t want Tardis and the boys to hurt each other! Thankfully, the ABA therapists gave us some great tips. The first big tip they gave us was a social story. Social Stories are great way to teach difficult concepts, including how to play with pets. A Social Story is a guide that describes various situations or interactions that a person might encounter. You can view the power point presentation of our Tardis Social Story, Nice Hands to Tardis, here. Every day, we read this story to our sons. 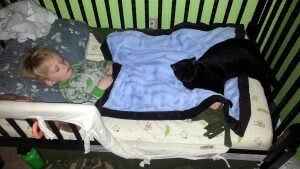 Both boys love it, especially Corwin, our autistic son. 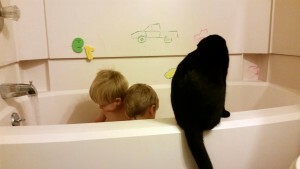 He will sometimes ‘read’ it by himself to us. He’s a huge fan of Tardis and loves to just look at photos of him. 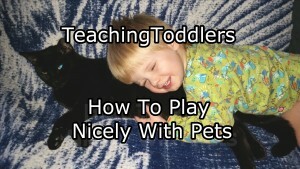 The second big tip they gave us was to really teach them how to play kindly with pets. 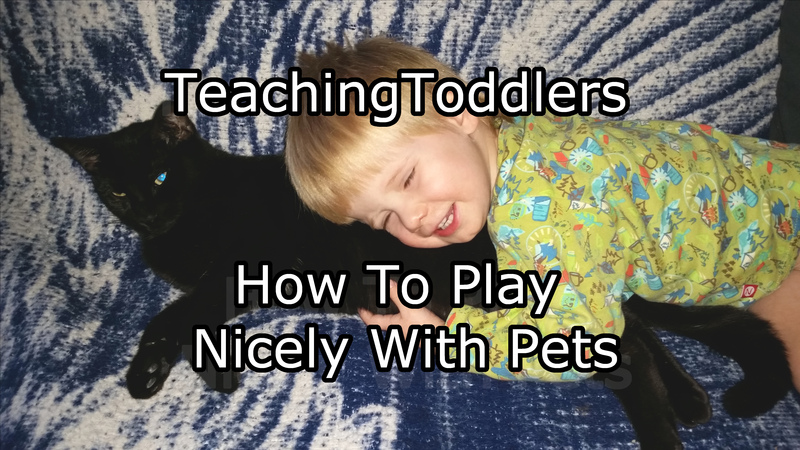 Make it easy for toddlers to get harmless pet interaction. Make it easy for your toddlers to find fun ways to engage their pets. For Tardis, that was helping to brush him, feed him, fill his water bowl, and giving him lots of yummy treats. It’s lightweight enough and long enough that the boys can get plenty of engagement with Tardis without the risk of hitting him with the stick part. When the boys wanted to throw things to Tardis, we encouraged them to only throw pompoms or soft mice. Remove them from each other once aggression occurs. Although we try our best to shape the boys’ behavior by remaining close to them and catching them before aggressive behavior starts, sometimes I look across the room or lawn to see a child harassing Tardis. When this occurs, we separate the two. 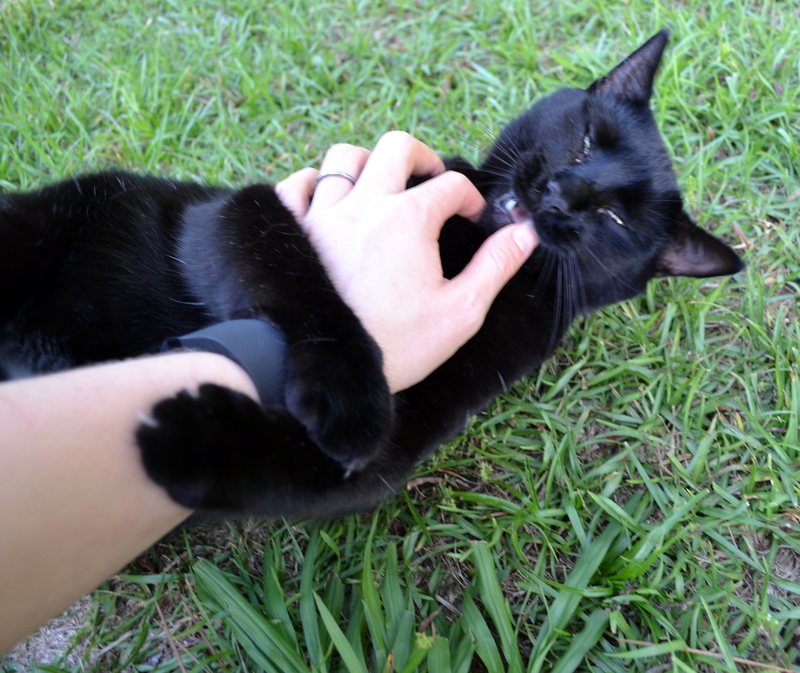 I give Tardis lots of attention and apologies, and remove him saying that he will play with us again when the boys can use ‘nice hands’. After a brief separation, we bring Tardis back out and prompt easy, good behavior. Try to find out what is driving the harassment. My one son seems to only harass Tardis out of a genuine desire to play with him and a lack of understanding of what Tardis enjoys. My other son will sometimes harass Tardis when he’s tired because he wants my attention and knows that I will immediately respond. 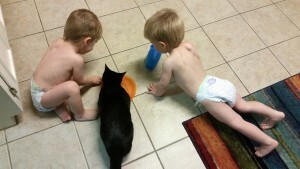 With him, it was vitally important that we taught him ways to express his need for attention without cat harassment. For him, using various Tools To Teach Emotion worked really well. Remember that they’re toddlers. Don’t expect change over night. 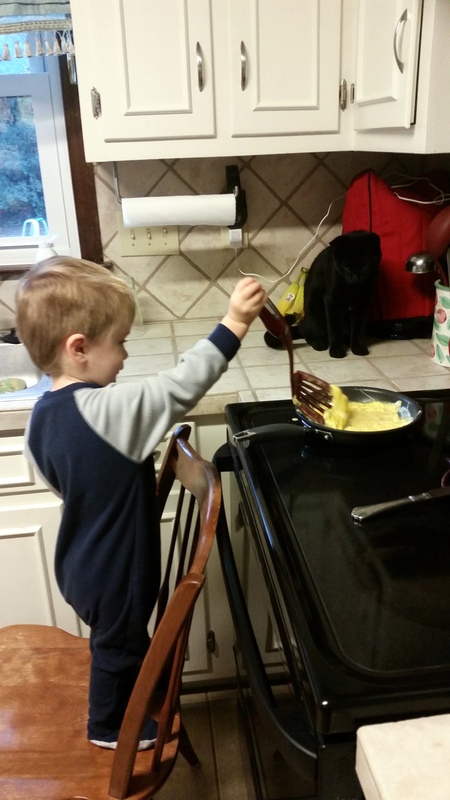 A frustrating thing about techniques with toddlers is that you can’t always tell when the methods are working. Sometimes there is what is called an ‘extinction burst’, which is where a behavior ramps up before it vanishes. When we were putting this most recent behavior plan in place, the therapists suggested that we try for 2 weeks, then reevaluate if we didn’t see change. It took a bit of time, but we did see change and significant change. Tardis is a pretty awesome cat and I hope that the boys can one day appreciate how patient and loving he is with them.